In 1895, William G. Morgan, an instructor at the Young Men’s Christian Association (YMCA) in Holyoke, Mass., decided to blend elements of basketball, baseball, tennis, and handball to create a game for his classes of businessmen which would demand less physical contact than basketball. He created the game of volleyball (at that time called mintonette). Morgan borrowed the net from tennis, and raised it 6 feet 6 inches above the floor, just above the average man’s head.During a demonstration game, someone remarked to Morgan that the players seemed to be volleying the ball back and forth over the net, and perhaps “volleyball”would be a more descriptive name for the sport. On July 7, 1896 at Springfield College the first game of “volleyball” was played.In 1895, game was invented in the USA by William G. Morgan.In 1897, the first Volleyball Rules were published by Morgan. In 1900, a special ball was designed for the sport. In 1905, volleyball was introduced to school in China. In 1908, volleyball was introduced to Japan. In 1910, volleyball was introduced to the Philippines. In 1913, the first International Volleyball Competition occurred at the Far East Games. In 1916, in the Philippines, an offensive style of passing the ball in a high trajectory to be struck by another player (the set and spike) were introduced. In 1917, the game was changed from 21 to 15 points. In 1920, three hits per side and back row attack rules were instituted. 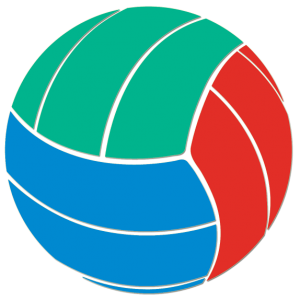 In 1928, The USA Volleyball Association was formed. In 1930, the first two-man beach game was played. In 1934, the approval and recognition of national volleyball referees. In 1947, the Federation Internationale De Volley-Ball (FIVB) was founded and Mr. Paul Libaud (France) became the first FIVB President. In 1948, the first two-man beach tournament was held. In 1949, the first World Senior Men’s Championships were held in Prague, Czechoslovakia. In 1952, the first World Senior Women’s Championship was played in Moscow, USSR. In 1952, The AVC was formed with Mr. Nishikawa (Japan) as President. In 1964, Volleyball was first played in the Olympic Games in Tokyo, Japan. And an AVC team (Japan, women) won the first Olympic gold medal. In 1965, the first World Cup for Men was played. In 1972, an AVC team (Japan, men) won a second Olympic gold medal. In 1973, the first World Cup for women was played. In 1974, the World Championships in Mexico were telecast in Japan. In 1975, the first Asian Senior Men’s and Women’s Championships were played in Australia. In 1976, an AVC team (Japan, women) won a third Olympic gold medal. In 1977, the first World Junior Men’s and Women’s Championships were played in Rio, Brazil. In 1980, the first Asian Junior Men’s and Women’s Championships were played in Korea. In 1984, an AVC team (China, women) won a fourth Olympic gold medal. In 1984 Dr. Ruben Acosta elected as the FIVB President. In 1985, Mr. Y. Matsudaira (Japan) was elected AVC President. In 1987, the FIVB added a Beach Volleyball World Championship Series. In 1989, the first World Youth Girls’ Championship was played in Brazil. In 1989, the first World Youth Boys’ Championship was played in UAE. In 1989, the first edition of the Men’s World League was played. In 1990, the World League was created. In 1993, the first edition of the Women’s World Volleyball Grand Prix was played. In 1993, AVC established a Zonal structure, the first in the world. In 1994, Mr. Y. Matsudaria (Japan) was elected FIVB First Vice President. In 1995, 100th anniversary of volleyball. In 1996, 2-person beach volleyball was added to the Olympics. In 1997, Mr. Yuan Weimin(China) was elected as AVC President. In 1999, AVC Cup Men’s and Women’s Club Volleyball Tournaments were played. In 2001, Mr. Jizhong Wei (China) was elected as AVC President. In 2008, Dr. Saleh A. Bin Nasser (Saudi Arabia) became the new AVC President.